Personal Attributes: We believe that you need to naturally have the right personal attributes to succeed. Training, knowledge and practical experience cannot replace talent and passion for the job at hand. All our training courses come with knowledge certificates. The Risknowlogy Certified Technicians and Operators followed one more training courses. He or she performs technical work in the factory or plant and has hands on experience in the field when working with SIL. 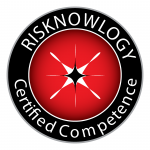 The Risknowlogy Certified Specialist has attended one or more certification courses. The Risknowlogy Professional is capable of managing the Operator and/or Technician and help with his or her job. The Risknowlogy Certified Professional, Expert and Master cannot only demonstrate that they understood the role in theory but that they are also able to apply it in practice. Gaining and demonstrating that you acquired the knowledge and have experience in one role is one thing. The next step is to demonstrate that what you have learned in theory you can also apply in a complete field. You want to demonstrate that you have the practical experience in that field as well. We do this with Field Certificates. We currently certify people in the fields of Functional safety (IEC 61508, IEC 61511, IEC 62062, EN50126, EN 50128, EN 50129, ISO 26262, etc). The Risknowlogy Certified Professional, Expert and Master cannot only demonstrate that they understood the field in theory but that they are also able to apply it in practice. Why do you need to prove your competency? The basis of our conformity assessment program for persons is based on ISO 17024.